Toshiba's Satellite U500 is a great laptop that doesn't make any compromises when it comes to features and performance. It's also very well priced. Above all, it's comfortable to use, looks good and is solidly built. You can't go past it if you're looking for something small and usable for under $2000. Toshiba calls the 13.3in Satellite U500 (PSU5EA-00X012) its 'hero' notebook because it combines a small size with powerful performance, and it has almost all the features that are found on bigger laptops in the Satellite range. It runs an Intel Core 2 Duo CPU and has plenty of RAM, a dedicated graphics card, a large hard drive, and a built-in DVD burner. You also get modern ports and network connectivity, and plenty of useful Toshiba innovations such as Sleep-and-Charge USB 2.0 ports and Eco mode. Indeed, the 'hero' moniker is apt. The Toshiba Satellite U500 (PSU5EA-00X012) has a modern and attractive design: a textured lid and palm-rest area, chrome trim and glossy keys. It stands out from most laptops on the market, but it looks classy rather than garish. It feels well constructed: picking it up with one hand from either edge doesn't result in the chassis flexing (even when holding it from the side with the optical drive), and the lid is strong enough to prevent the screen from puddling when you bend it. There are vent holes on the left side of the chassis that help extract the heat generated by the CPU; after using the Satellite U500 for over two hours straight, its base barely got warm. You can easily use this notebook on your lap without feeling the heat. In fact, when the Satellite U500 ran in Eco mode its base remained completely cool. 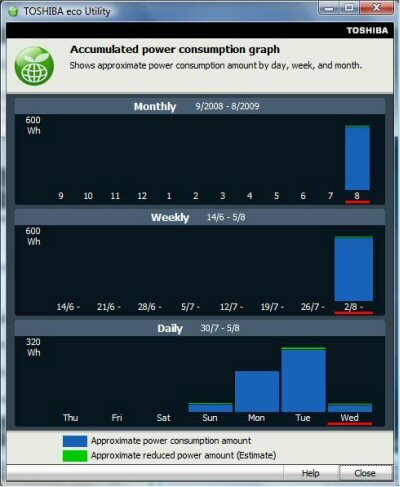 Eco mode is Toshiba's power management utility. To customise it, you have to go through the Power Options in the Windows Vista Control panel. Eco mode offers a quick way to reduce the CPU speed (by almost 1GHz) and the brightness of the screen, switch off the keyboard and media panel LEDs, and enable sleep mode. It can be invoked by pressing the Eco button that resides just above the keyboard. In our battery test, in which we loop a video while using maximum power and screen brightness and enabling the wireless radio, the Toshiba Satellite U500 lasted 1hr 36min. This is a very short time, especially for a laptop with a 6-cell battery (by comparison, the Dell Vostro 1320 lasted well over two hours with a 4-cell battery). However, when we repeated the test in Eco mode the notebook lasted 2hr 14min. In our performance benchmarks, the Satellite U500's Intel Core 2 Duo P8700 CPU (2.53GHz), 4GB of RAM, ATI Mobility Radeon HD 4500 graphics and 250GB, 5400rpm hard drive produced very good results. In the WorldBench 6 application suite it attained a score of 100. This is 10 points better than the Dell Vostro 1320, which only had 1GB of RAM. The extra RAM helps greatly when running office applications and multitasking. It means you can run pretty much any type of program and not experience too much lag. The notebook's ATI Mobility Radeon HD 4500 graphics adapter scored 3126 in 3DMark06, so you can even play a few games on it (not high-end ones though). The Toshiba Satellite U500 will also easily handle media encoding, image editing, even some video editing and 3D rendering. It recorded a time of 1min 12sec in the Blender 3D test, which is almost exactly what we expected of a 2.53Ghz CPU (it took 3min 58sec with Eco mode enabled). The notebook recorded a time of 1min 9sec in the iTunes MP3 encoding test, which is also an expected result. The 320GB SATA hard drive (a Hitachi HTS545032B9A300) recorded 21.4 megabytes per second in our file transfer tests, which is marginally faster than we expected from a 5400rpm hard drive. If you use the Satellite U500 for image or video editing, you can make use of its eSATA port by adding an external scratch disk. It resides on the left side of the laptop and also doubles as a USB 2.0 port. The USB 2.0 ports on the U500 are of the Sleep-and-Charge variety, which means they will charge devices even while the laptop is switched off. They worked as promised with a Creative Zen MP3 player and even an Apple iPhone. 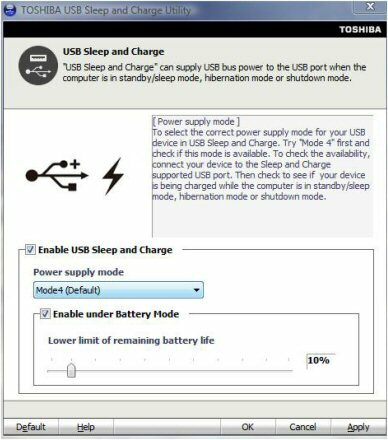 The Sleep-and-Charge ports can be configured within Windows. You can tell the Satellite U500 to stop charging devices after the notebook's battery life is reduced to a certain percentage. As well as eSATA, you get an ExpressCard/54 slot, an SD card slot, a fingerprint reader (we never had to swipe twice to log in during our tests), a 1280x768-resolution webcam, Gigabit Ethernet, 802.11n Wi-Fi, Bluetooth, D-Sub and HDMI. It's definitely a fully stocked laptop and it only weighs 2.2kg. What impressed us even more than the Satellite U500's specifications was its keyboard, which feels great to use. The keys are 16mm wide (with a 4mm gap in between), smooth and glossy, and they produce good travel and response. They are also backlit, which makes it easy to type at night without having to switch on your room lights. You can set the length of time the keys are illuminated, or you can choose to have them constantly illuminated. 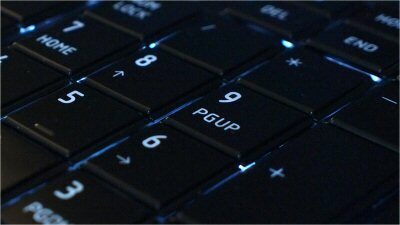 The backlit keys look great and make the Satellite U500 easy to type on at night. The media player buttons above the keyboard are constantly illuminated unless you are using Eco mode. You also get physical buttons to disable the touchpad and wireless radio. One feature that's absent that we're used to seeing on Toshiba laptops is a rotational volume control. You can adjust the volume by pressing the +/- buttons above the keyboard. There's is very little to dislike about the Toshiba Satellite U500. It looks good, feels great to use, it's solidly built, and it has an extensive feature-set and top-notch specifications. We recommend it to anyone who wants a relatively light, fully featured laptop for serious work and easy mobility.